While preparing submissions for The Families of Clarion County, Pennsylvania to be published by the Clarion County Historical Society I solved one of the many mysteries in my family tree - the final fate of Pvt. John McDonald - Civil War Solider. For many years I knew John had served in the Civil War - I just had not come to a conclusion on what happened to him as there was no record of him following the war. While researching Civil War Muster Rolls I connected with Joe Nihen. Joe has been researching members of the 208th Regiment, Pennsylvania Volunteer Infantry, Company H. He was also searching for a John McDonald but after discussion we concluded we were not searching for the same John McDonald. Despite all of that Joe helped to locate some documents on the John McDonald I was looking for - my 4th great uncle. Special thanks to Joe for his willingness to assist me - it is most appreciated. John McDonald, son of Irish immigrants David McDonald and Bridget Dunn, was born 1836 in Farmington Township. The History of Clarion County Pennsylvania records David McDonald in the list of early settlers of Farmington Township. The 1850 United States Federal Census recorded John living with his parents and seven siblings in Farmington Township. His father David was recorded as a farmer. The birth location of his parents and older brother James was recorded as Ireland. The local school teacher, John Toomy, was also recorded living in the household. The 1860 United States Federal Census recorded John living with his parents and seven siblings in Farmington Township. His father David was recorded as a farmer. John was recorded in the June 1863 Civil War Draft registration records for Farmington Township. 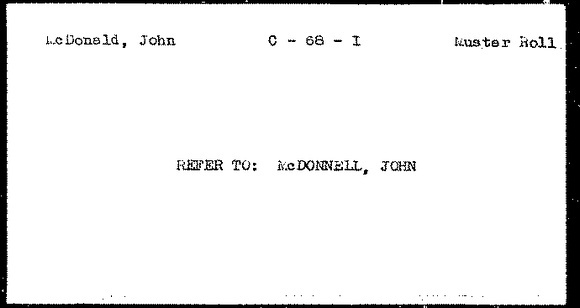 A copy of the draft registration record shows John on line 13 and his brother Michael on line 12. The History of Clarion County Pennsylvania indicates John enlisted in the Union Army. He initially served with Company F, 63rd regiment. He was later transferred to Company H, One Hundred and Fifth Regiment on February 25, 1864. Details of the Company H, 105th Regiment, Pennsylvania indicate that the company participated in the several battles after John mustered into the regiment. John's specific involvement in these battles is unknown. Fought on May 4-8, 1864 at the battle of The Wilderness in Spotsylvania County and Orange County, VA. Fought on 10 May 10, 12, 15, 19, 23 and 24 1864 at the battle of Spotsylvania Court House in Spotsylvania County, VA. Fought on May 23 and 24 1864 at the battle of North Anna in Caroline County and Hanover County, VA. Fought on 31 May 31, 1864 the Battle of Cold Harbor in Hanover County, VA. Fought on June 14, 15, 16, 18, 19, 20, 21, 22 and 23 1864 at the Battle of Petersburg in, Petersburg, VA. Fought on August 6, 12, 15, and 16, 1864 at The Second Deep Bottom Battle at Henrico County, VA. Fought on August 18 and 21, 1864 at Petersburg, VA. Fought on September 4, 1864. Fought on September 9, 10 and 16, 1864 at Petersburg, VA. Fought on September 19, 1864. 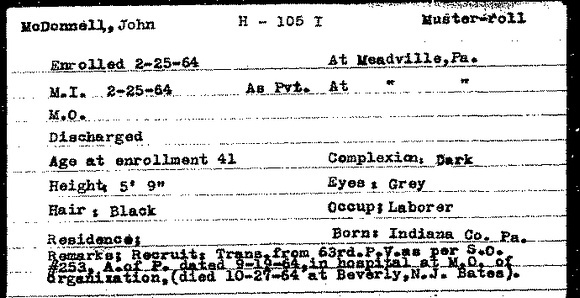 The Pennsylvania State Archives Civil War Veteran's Card File, 1861-1866 indicates that John McDonald was filed as John McDonnell. Notes in John's file indicated was hospitalized from wounds that he received. He died on October 16, 1864 from chronic diarrhea. He is recorded in the Registers of Deaths of Volunteers. He is recorded on the third line from the bottom. He is buried in Beverly National Cemetery in Beverly, Burlington County, New Jersey. His grave marker references Company H, 105 PA. Inf. To view a copy of his grave marker visit this link. John left a few mysteries which remain unsolved. The Last Will and Testament for John’s father David McDonald was recorded February 16, 1871. The will includes references that John was deceased and had a son named William: “the sum of one dollar to my grandson William McDonald son of John McDonald now deceased.” To date no additional details are known about William. John McDonald is my 4th great uncle. He is the son of David McDonald and Bridget Dunn my 4th great grandparents. My paternal grandmother Mary Eugenia McDonald is a descendant of David McDonald and Bridget Dunn through their son Michael McDonald. 1850 United States Federal Census. Source Citation: Year: 1850; Census Place: Farmington, Clarion, Pennsylvania; Roll: M432_767; Page: 193B; Image: 392. Record for David McDonald. Line 42. 1850 United States Federal Census. Source Citation: Year: 1850; Census Place: Farmington, Clarion, Pennsylvania; Roll: M432_767; Page: 193B; Image: 392. Record for Bridget McDonald. Lines 1-10. 1860 United States Federal Census. Source Citation: Year: 1860; Census Place: Farmington, Clarion, Pennsylvania; Roll: M653_1095; Page: 144; Image: 148; Family History Library Film: 805095. Record for David McDonald. Lines 10-19. 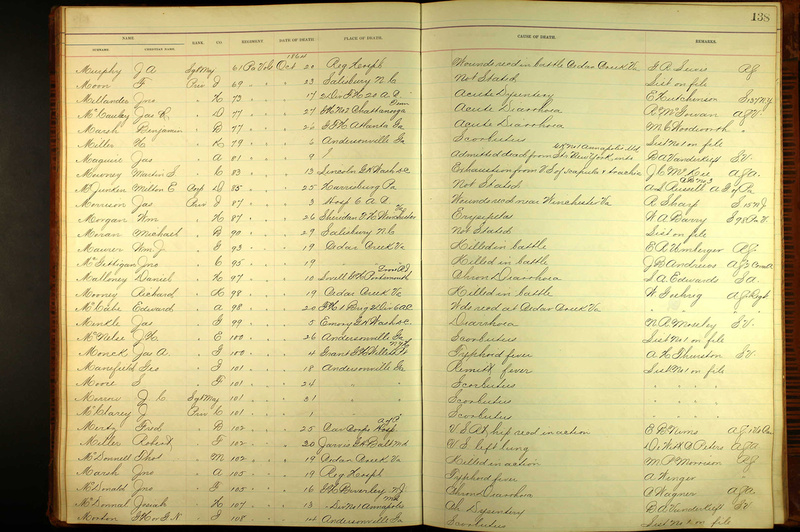 National Archives and Records Administration (NARA); Consolidated Lists of Civil War Draft Registration Records (Provost Marshal General's Bureau; Consolidated Enrollment Lists, 1863-1865); Record Group: 110, Records of the Provost Marshal General's Bureau (Civil War); Collection Name: Consolidated Enrollment Lists, 1863-1865 (Civil War Union Draft Records); ARC Identifier: 4213514; Archive Volume Number: 2 of 2. Record for John McDonald, 20th Congressional District. Ancestry.com. U.S., Registers of Deaths of Volunteers, 1861-1865 [database on-line]. Provo, UT, USA: Ancestry.com Operations, Inc., 2012. 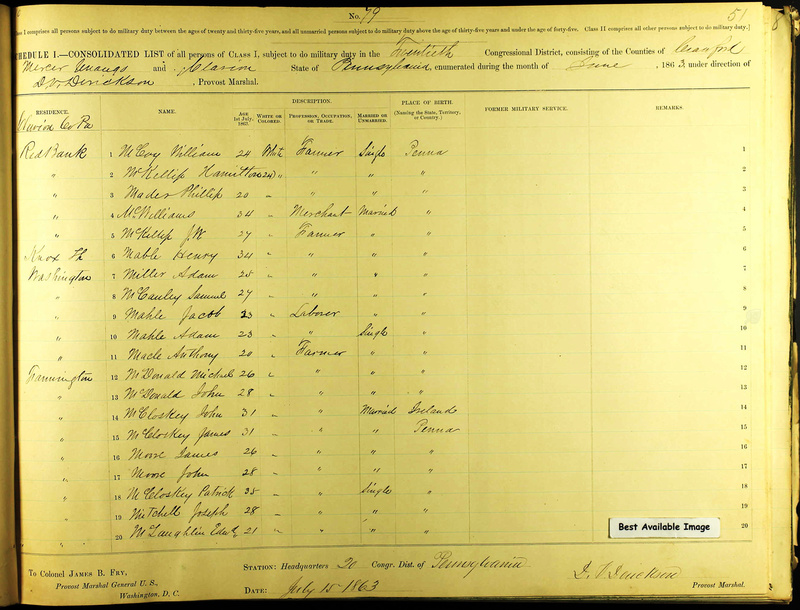 Original data: Registers of Deaths of Volunteers, compiled 1861–1865. ARC ID: 656639. Records of the Adjutant General's Office, 1780's–1917. Record Group 94. National Archives at Washington, D.C. Record for Jno McDonald. Find A Grave. Pvt John McDonald. Find A Grave Memorial# 27625754.